The air quality started deteriorating rapidly from 7 pm. The Air Quality Index was 281 at 7 pm. It rose to 291 at 8 pm and further deteriorated to 294 at 9 pm and 296 at 10 pm. A thick haze engulfed the national capital Wednesday night with the air quality deteriorating to the "very poor" category as Delhiites continued to burst firecrackers long after the deadline set by the Supreme Court, the authorities said. The overall Air Quality Index (AQI) was recorded at 302 at 11 pm, which fell in the very poor category, according to the Central Pollution Control Board (CPCB). The air quality started deteriorating rapidly from 7 pm. The AQI was 281 at 7 pm. It rose to 291 at 8 pm and further deteriorated to 294 at 9 pm and 296 at 10 pm, according to the CPCB. The court had asked the police to ensure that banned firecrackers were not sold and said in case of any violation, the station house officer (SHO) of the police station concerned would be held personally liable, and it would amount to committing contempt of the court. But despite the apex court order, there were reports of its violation from many areas long after 10 pm. Several areas showed a spike in air pollution. Areas like Anand Vihar, ITO and Jahangirpuri, recorded very high pollution levels. Violations of the Supreme Court order were reported from Mayur Vihar Extension, Lajpat Nagar, Lutyens Delhi, IP extension, Dwarka, Noida Sector 78 among other places. The police admitted that there were violations, adding that they would take serious legal action against those violating the apex court order. The online indicators of the pollution monitoring stations in the city indicated "poor" and "very poor" air quality as the volume of ultra-fine particulates PM2.5 and PM10, which enter the respiratory system and manage to reach the bloodstream, sharply rose from around 8 pm. According to the CPCB data, the 24-hour rolling average of PM2.5 and PM10 were 164 and 294 micrograms per cubic metre respectively. The SAFAR forecast "bad" air quality Thursday even though partially toxic crackers were burst as compared to 2017. It also said the pollution levels would peak between 11 am and 3 am on Wednesday and Thursday. 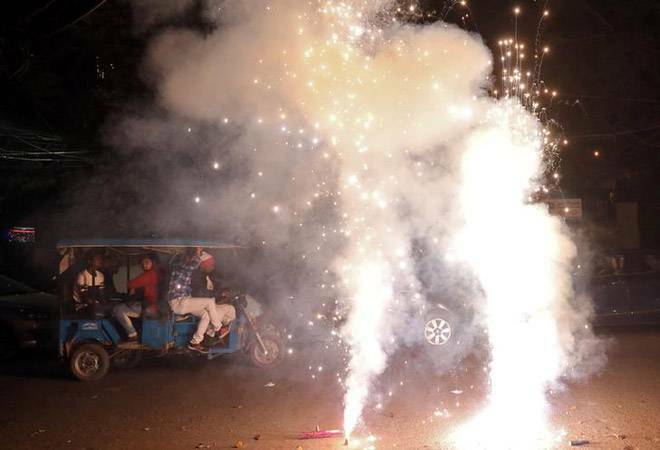 The situation was similar, if not worse, in the neighbouring areas of Delhi such as Gurugram, Noida and Ghaziabad, where crackers were burst, as usual, raising question marks on the efficacy of the administration in enforcing the apex court's ban. A "very poor" AQI essentially means that people may suffer from respiratory illnesses on prolonged exposure to such air. If the air quality dips further, the AQI will turn "severe", which may trouble even those with sound health conditions and seriously affect those with ailments. As many as 209 calls were received by the Delhi Fire Services on Diwali, including one related to a huge fire in a factory at Bawana, officials said. Of these, 89 calls were related to fire incidents at garbage and dump yards, while the rest were related to fire incidents involving electric wires, at factories and residential areas, a senior Delhi Fire Service officer said. The officials said the number of calls related to firecrackers was comparatively low, but there was no decline in the number of calls related to fire incidents. The Centre, in collaboration with the Delhi government, has launched a 10-day "Clean Air Campaign" from November 1 to 10 to monitor and report polluting activities as well as to ensure quick action. About 52 teams deployed under the campaign are visiting different parts of Delhi and the adjacent towns of Faridabad, Gurugram, Ghaziabad and Noida. The teams are being led by the sub-divisional magistrates of the respective areas and comprise senior officials of the Ministry of Environment, Forest and Climate Change (MoEFCC), representatives of the CPCB, the Municipal Corporation of Delhi (MCD) and the Delhi Pollution Control Committee (DPCC).